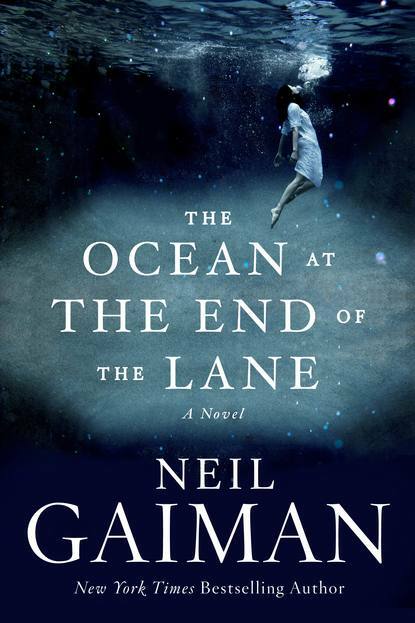 A few weeks ago, Tia Mansouri wrote about what she anticipated from Neil Gaiman's latest novel, The Ocean at the End of the Lane, based solely on its cover art. Now that she has read the novel, here is her follow-up review. Warning: This review contains slight spoilers. In my discussion of the cover alone, I touched upon a theme in many of Gaiman’s books: of a place beyond the normal, a bridge between what we know and something beyond, and how characters in Gaiman’s books are always stumbling across this nexus. I hinted that the book would have to do with memory and development, and that’s going to be my point of focus in my follow up discussion. Memory is a fluid thing; if we take the idea of water as a symbol for memory, then this bridge between worlds that the narrator stumbles across becomes a manifestation of water and memory both. It is, as Gaiman writes, “an ocean that stretches from forever to forever”. The extraordinary, and supernatural as well, seem to suddenly appear all around his characters, just as thoughts and memories that are somehow forgotten become clear and daunting in their apparent ubiquity. There’s a concept in memory science called associative retrieval, a way of recall involving a cue that then triggers an experience of remembering. The memory returns to us, oftentimes flooding our minds, and depending on the intensity of what we remember, we’re left to ask ourselves how we could have even forgotten something so poignant in the first place. When the narrator returns to his childhood neighbor’s home and stands at the edge of their pond, something clicks in him, and his mind is swept away. Episodic memory, too, plays a role; it’s a kind of magic, or time-travel, because the act transports us back in our own memories, and lets us interpret the episode in light of our current knowledge. The loneliness, confusion, and terror of childhood are seen in a different light, as are the joys, the profundities, the treasures. The two central images in the book, the ones that will linger with readers, concern water, and are the images that most closely match the covers. The first time we’re exposed to immersive imagery, it is in the context of a near drowning inside a bathtub – the kind of memory so horrifying it is understandable if someone suppresses it or forgets it entirely, only to be shockingly reminded of it with a disturbing intensity of recollection. The idea of retracing memories, some of which can be harrowing, makes us wonder whether it’s worse experiencing them as a child or remembering them as an adult – Gaiman would argue for the latter, judging by the epigraph from Maurice Sendak:"I remember my own childhood vividly … I knew terrible things. But I knew I mustn't let adults know I knew. It would scare them." The second deals with a metaphysical healing process, in almost direct opposition to the near-death experience of drowning. The pages describing the narrator’s experiences are some of the most beautiful words of Gaiman’s I’ve ever read; in this mystical immersion, Gaiman revisits the idea of that border between real and unreal and take it to another level of conscious awareness – it perfectly blends what I loved about the cover and mentioned in my prior discussion, creating a harmony between the celestial and aquatic. We’re reminded often that memories are merely records of how we experienced events, not replicas of the events themselves. Our own subjective experiences create paths for us to follow again in order to retrieve these memories; but the clues must be available. Because Gaiman’s narrator is unreliable and the events so fantastical, but memory itself so subjective, it all somehow works, entwined together. When the narrator wants to stay in this ocean indefinitely, he is told that he can’t, because he would dissolve and be made one with it; it similarly does not do well for us to dwell on memories for too long, because then we risk losing ourselves. It seems as though the narrator forgets the events he’s just finished recounting as he leaves at the end of the novel. But perhaps it is enough to simply recollect and feel in the moment in order to get what we need to keep going; and just because we’ve seemingly forgotten a memory does not mean it is any less real, or that it didn’t happen at all.